Dr Zed Rengel is Professor of Soil Science and Plant Nutrition at the University of Western Australia. An internationally-renowned expert on plant nutrition, Professor Rengel is co Editor-in-Chief of Crop and Pasture Science, Editor of the Journal of Plant Nutrition and Journal of Botany, Associate Editor of Crop Science and the Journal of Plant Physiology, as well as being on the editorial board of several other journals. He has published 7 books and over 300 articles, has held a number of Honorary and Visiting Professorships and been elected a Foreign Fellow of the Croatian Academy of Arts and Sciences. His h-index (Hirsch index showing the n papers that have been cited at least n times) is 76 (Google Scholar) or 58 (Clarivate Analytics, Web of Science). This collection reviews current research on understanding nutrient cycles, the ways crops process nutrients, the environmental effects of fertilizer use and how this understanding can be used to optimise nutrient use efficiency (NUE) and reduce fertiliser use. Chapters summarise research on the primary macronutrients: nitrogen, phosphorus and potassium. They also discuss secondary macronutrients and micronutrients including: calcium, magnesium, zinc, boron, manganese and molybdenum. The final two parts of the book review research on fertiliser application. Chapters cover topics such as assessing nutrient availability and advances in integrated plant nutrient management. Other chapters discuss enhanced efficiency fertilisers, the use of bio-effectors/bio-stimulants, fertigation techniques and organic amendments. 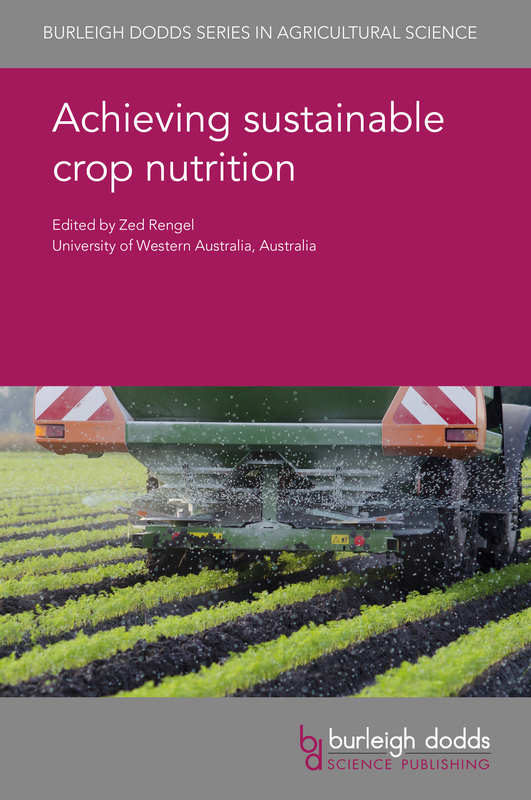 "Prof. Zed Rengel has assembled an impressive list of authors for his upcoming book 'Achieving sustainable crop nutrition’. The content is wide-ranging, covering agronomic and environmental aspects of crop nutrients highlighting recent advances and solutions to sustainable crop management. This volume will be a valued reference for all those interested in understanding and working in nutrient management."